Super Bowl prop bets have just about every single one of the more than 110 million expected viewers covered. 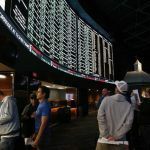 Oddsmakers at both land-based casinos and online sportsbooks have assembled a bounty of lines that give bettors propositions on everything from the actual outcome of the game to whether national anthem singer Luke Bryan will flub the song. The spread on Super Bowl LI between the Patriots and Falcons has largely remained idle since opening after the conference championships last weekend. New England is still a three-point favorite over Atlanta at the majority of the sportsbooks in Las Vegas and online. Super Bowl LI takes place on February 5 at 6:30 pm ET in Houston, Texas. For those more interested in the commercials than the pigskin, oddsmakers are hoping to appeal to the masses with novelty and prop bets. The Westgate SuperBook has 400 prop bets, but the outcome of each depends on some component of the play on the field. While that’s an abundance of offerings and greatly welcomed by sports gamblers and football fanatics, they won’t attract the casual Super Bowl viewer. Online books are where the “fun” bets are, and they’ve got something for just about anyone even remotely interested in adding a financial incentive to their Super Bowl viewing experience. Lady Gaga’s halftime show is garnering the majority of the prop bets. Bookies are asking what the pop star will wear during her performance, with hat/headdress at -150, followed by glasses/sunglasses +200, wings +500, tail +1600, “I voted Hillary” t-shirt +2500, and “absolutely nothing” at +10000. A wardrobe malfunction possibility comes in at yes +500, no -1000. Sites are also asking if bettors believe Mother Monster will reference Donald Trump (Yes -140, No +100). Speaking of the 45th president, you can gamble on whether the new commander-in-chief will attend Super Bowl LI (Yes +220, No -335). Retired boxing great Floyd Mayweather is no stranger to sports betting, and you can gamble on his gambling. “What will be the largest bet placed by Floyd Mayweather” features a series of thresholds, with $100,001-$250,000 the favorite at +175. What color liquid will be dumped on the winning coach is also up for grabs. Clear/water, lime/green, yellow, and orange are all offered at +300. Those colors are followed by red +600, blue +750, and purple +1200. Finally, bettors can even take odds on Animal Planet’s Puppy Bowl XIII. The spread is even with Team Ruff and Team Fluff both at -120. 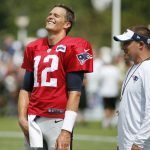 Getting back to the game itself, Patriots quarterback Tom Brady is chasing his fifth NFL ring with coach Bill Belichick. Sports bettors in Nevada are apparently largely divided, as action has been split on both New England and Atlanta. That’s keeping the overall point spread at just a field goal. Both teams have incredible offenses led by two of the best passers in the NFL. 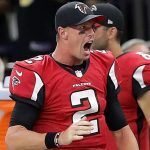 Falcons QB Matt Ryan led the league with a 117.1 quarterback rating during the regular season. But of course, the Patriots have Brady, one of the best to ever play the position in the history of the game. A week from today, the outcome and the Super Bowl props are determined.